over the counter viagra There are a few species of birds at Mission Trails Regional Park (MTRP) that sport a bright blue coat with orange accents: The common and year-round resident western bluebird (Sialia mexicana), the summer breeding lazuli bunting (Passerina amoena) and its cousin, the blue grosbeak (Passerina caerulea). These three were among the 82 species of birds spotted in the park this April and recorded on iNaturalist.org. cheap generic viagra The magnificent blue grosbeak, recorded by Roger Uzun at bit.ly/2LGPdM0, is found in San Diego County from mid-April to mid-August. It relies on native habitat such as riparian areas or grasslands and nests in low to medium growing shrubs. MTRP offers pristine breeding grounds for this thick-billed bird, which tends to poorly adapt to urbanization, according to the “San Diego County Bird Atlas” by Philip Unitt. click here As with most bird species, the male is the one wearing the attractive “make-up” consisting of a vibrant blue plumage and orange wing bars. He will be the first to arrive on the summer premises and once joined by a female, they will proceed to raise up to two broods before departing south to their wintering homes. 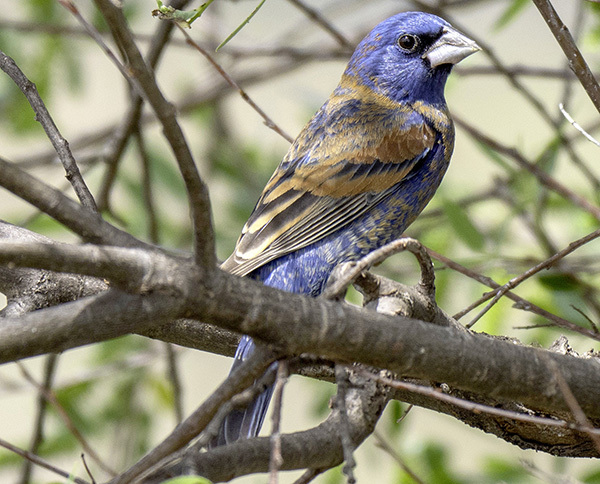 You can check out the other bright blue/orange birds spotted in April: The western bluebird (bit.ly/2O0jv9a); and the lazuli bunting (bit.ly/2vn33rK). — Patricia Simpson is a trail guide at Mission Trails Regional Park.